The Complete Works of William Shakespeare. Performed as you’ve never seen them before . . . all at once, in 90 minutes! This is the Sparks Notes version of Shakespeare, with all the fun stuff in there. 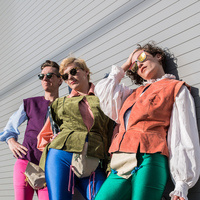 Join PAE in the parks, wineries, and universities as we play with the Bard like we never have before! Performance will be in front of Eliot Hall, south side, near the large sculpture (not in front of the library).